Forgetting to include a data flow or pointing an arrow in the wrong direction. An example is a drawn process showing all its data flow as either input or output. Each process transforms data and must receive input and produce output. This type of error usually occurs when the analyst has forgotten to include a data flow or has placed an arrow pointing in the wrong direction. Process 1 in the figure illustrated below contains only input because the GROSS PAY arrow is pointing in the wrong direction. This error also affects process 2, CALCULATE WITHHOLDING AMOUNT, which is in addition missing a data flow representing input for the withholding rates and the number of dependents. 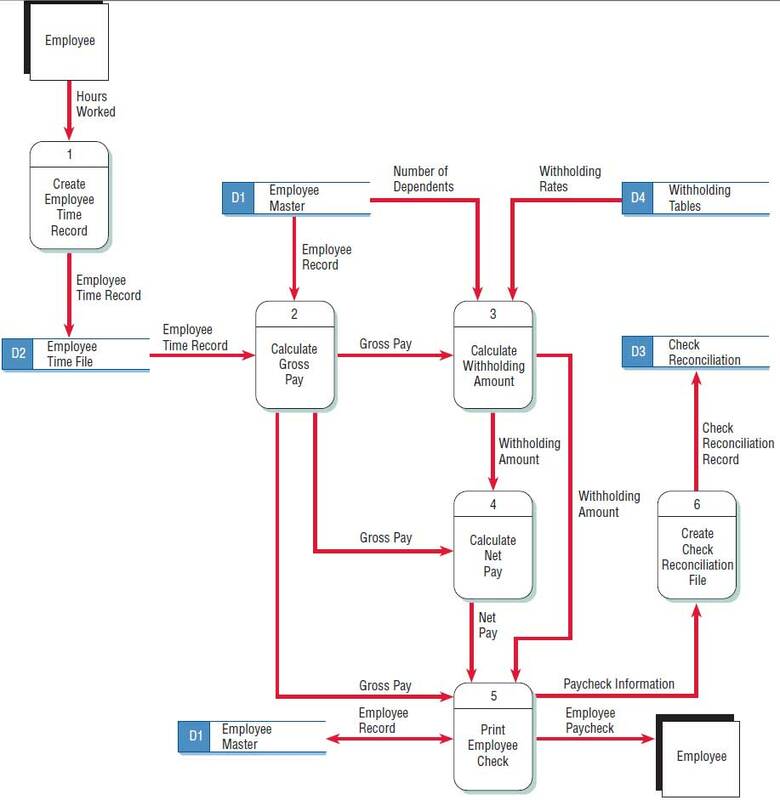 Typical errors that can occur in a data flow diagram (payroll example). Connecting data stores and external entities directly to each other. 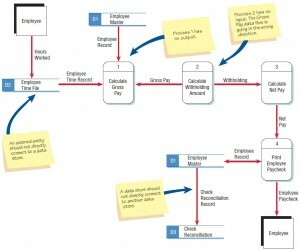 Data stores and entities may not be connected to each other; data stores and external entities must connect only with a process. A file does not interface with another file without the help of a program or a person moving the data, so EMPLOYEE MASTER cannot directly produce the CHECK RECONCILIATION file. External entities do not directly work with files. For example, you would not want a customer rummaging around in the customer master file. Thus, the EMPLOYEE does not create the EMPLOYEE TIME FILE. Two external entities directly connected indicate that they wish to communicate with each other. This connection is not included on the data flow diagram unless the system is facilitating the communication. Producing a report is an instance of this sort of communication. A process must still be interposed between the entities to produce the report, however. Incorrectly labeling processes or data flow. 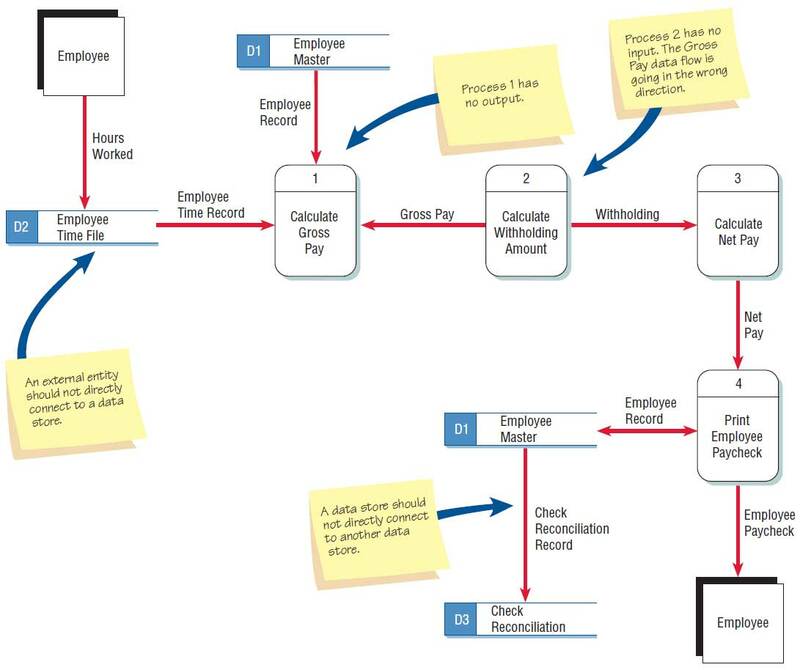 Inspect the data flow diagram to ensure that each object or data flow is properly labeled. A process should indicate the system name or use the verb-adjective-noun format. Each data flow should be described with a noun. Including more than nine processes on a data flow diagram. Having too many processes creates a cluttered diagram that is confusing to read and hinders rather than enhances communication. If more than nine processes are involved in a system, group some of the processes that work together into a subsystem and place them in a child diagram. Omitting data flow. Examine your diagram for linear flow, that is, data flow in which each process has only one input and one output. Except in the case of very detailed child data flow diagrams, linear data flow is somewhat rare. Its presence usually indicates that the diagram has missing data flow. For instance, the process CALCULATE WITHHOLDING AMOUNT needs the number of dependents that an employee has and the WITHHOLDING RATES as input. In addition, NET PAY cannot be calculated solely from the WITHHOLDING, and the EMPLOYEE PAYCHECK cannot be created from the NET PAY alone; it also needs to include an EMPLOYEE NAME, as well as the current and year-to-date payroll and WITHHOLDING AMOUNT figures. Creating unbalanced decomposition (or explosion) in child diagrams. Each child diagram should have the same input and output data flow as the parent process. An exception to this rule is minor output, such as error lines, which are included only on the child diagram. The data flow diagram in shown in the figure below is correctly drawn. Note that although the data flow is not linear, you can clearly follow a path directly from the source entity to the destination entity. 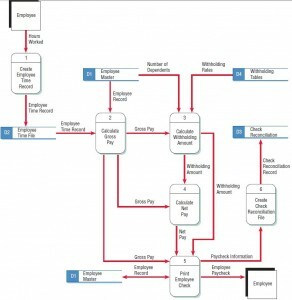 The correct data flow diagram for the payroll example.